The sections on European, Asian, and Native American mys were awesome. I could tell that the scholars had really spent a significant amount of time to organize the lectures into a cohesive and comprehensible course. The section on African myths needs development - I liked what I learned of the stories, themselves, but the course was significantly lacking in organization and attempting to connect the themes into larger issues of relevance. my favorite section was on Native American myths. It was obvious that the scholar had spent a lifetime researching and teaching these stories. The way these were presented stands in marked contrast to the these-are-some-cool-things-I've learned-about approach of the African myths. Three Fantastic Lecturers, + one iffy one. Multi-lecturer courses are always prone to fluctuations in quality… But 3 out of 4 ain't bad! Kathryn McClymond covers the myths of ancient Europe, the Middle East, and South Asia. Her lectures are fantastic, offering a good balance of storytelling and interpretation. She tells the stories, then uses them to construct a coherent cosmology of each culture, so you get a sense of their view of the real world and of the cosmos. It's also nice to have a woman's perspective on this stuff; history is still so male dominated, and she calls due attention to the sexism inherent in a lot of the myths, and what it says about the relevant culture. After her, Julius Bailey, who covers African myths, is a letdown. African myth is a huge subject, so his task is difficult. But he chooses to organize his myths by topic, NOT by culture, so it's impossible to get that sense of a coherent cosmology for any one culture. He's also not a good orator; he trips over the emphasis of every third sentence. Andre LaFleur's lectures on Asian and Pacific myths picks things right up again though. He provides a good balance of story and interpretation, and he steers clear of the typical pitfalls of a white guy teaching "foreign" cultures -- avoiding essentialism, or romanticizing the role of Westerners in documenting the material, for instance. Grant Voth's lectures on Native American myths are some of the best of the pack, even though -- according to his CV in the PDF -- he doesn't seem to have any formal experience with the topic. His task is like Bailey's, but he organizes his lectures by broad regions wherein there is a common mythic tradition (with variations), and so it's possible to get a sense of each culture -- or family of cultures, if you will -- and their cosmology. All in all, I recommend it -- you're bound to learn a lot. This course is one of the best audio book I ever listened to! It will take you from the myths of ancient Europe, turn south to Africa then East to reach China, Korea, Japan and the Pacific islands, to ends perfectly with the Native Americans myths. Incredible and fascinating. However, I have to point out like many other reviews that the performance in part 2 is bad. The speaker's talk is with a very monotone voice while stuttering and hesitating all the time. The way the lesson is built is also problematic for a better understanding. This decrease the interest of the African myths, which is a bummer. That being said, the 3 others parts are amazing, and this class should be mandatory to everybody on Audible! The first third was by far the best; she is an excellent reader. The "Africa" section failed to engage me. But the "American" section that ended the series had me involved again. How much our schools do not teach us!! This was a great course spending hours on European, African, Asian, Australia, Oceania, and the Americas myths, religions, and cultures. Sadly the Norse barely get a mention by a scholar who is very adept in Greek and Roman myth obviously knows little about the Norse religion or culture. It was exceptionally disappointing, there are many great scholars who teach Norse myth that could have been used. The material was interesting, but one of the lecturers (the second one, lecturing on the myths of Africa) was so difficult to listen to I almost abandoned the whole lecture. A 32 hour lecture series that would normally have taken me 3-4 weeks to get through ended up dragging on for 4 months. The western and Near Eastern lectures are more of a refresher than new information if you have any experience with the topics, but the lecturer keeps it interesting all the same. I was excited for the African and East Asian lectures because I had little to no knowledge of the topics. The African lectures, in my opinion, are very disorganized and the lecturer has a tendency to stutter or misspeak so that the flow of the narrative is regularly interrupted. Additionally, he is constantly jumping around the continent to discuss myths from many different cultures in the same lecture. This makes it very difficult to retain any of the information that he is offering and I frequently lost interest and would have to rewind to the beginning of the lecture. After making it over halfway through the series, I simply couldn't stop and move onto something else. By that point, however, I had really lost interest in the content and was just listening to have another completed title in my list. Diverse and entertaining, informative, and easy to listen to. I would recommend it to anyone who wishes to study the subject. Uneven due to different lecturers. What did you like best about Great Mythologies of the World? What did you like least? Appreciated the in depth knowledge of the professors and in general their delivery and presentation. There is not enough material or rather differences between the mythologies of the various African countries to have spent so much time on them. It became repetitive and boring. Obviously the myths are most interesting. Least interesting is too subjective to present with any validity. 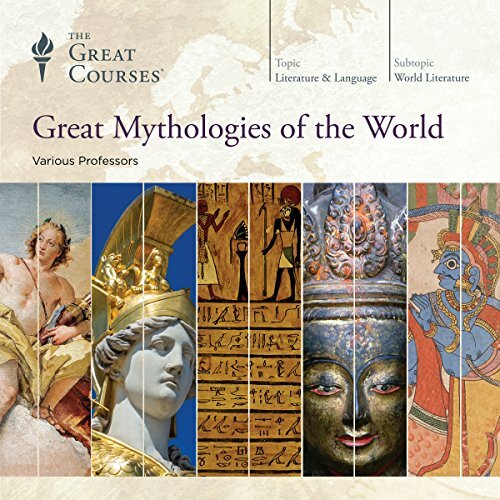 Was Great Mythologies of the World worth the listening time? I loved this great course! In Particular, African and Native American myths were fantastic as I was less familiar with these. There are layers here, and avenues to better understand who we are and why we think the way we do.